Last night we celebrate Halloween at Barmhem. As usual, the preparation is at least as fun as the celebration itself, so there was a lot of time and effort put in to decorate the children's home in all sorts of creepy cobwebs and bloody fabrics and much more. 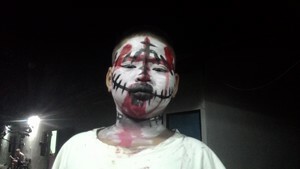 Once the decoration of Barmhem was done the transformation from cute children to scary monster took place. It is a delight to see how well the children are to cooperate and help each other. 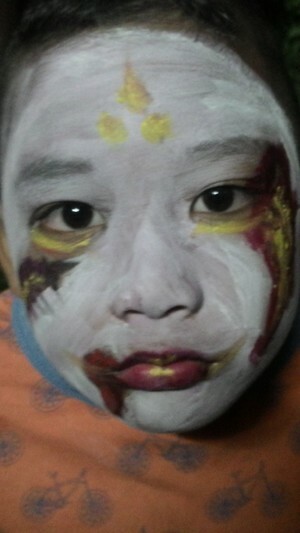 It was completely natural that the older children painted the younger. Slowly but surely our nice little home turned into a haunted home full of scary monsters. Icing on the cake was when the volunteers then took all the scary monsters on a ghost walk and scared the life out of the whole bunch. The volunteers noted cheerfully that they never could scare children in Sweden in this way - and our kids loved it. When the ghost walk was over the children sat down in the playroom to continue scaring each other with scary stories, and when the stories were ended, the ghost disco started. The evening ended in peacefulness as Wow took all the little ghosts to meditate in our Pagoda - and with this harmonious and beautiful sight, we left Halloween this time.